BIG SALE!! GEMSTONE CELESTIAL CARVINGS BIG SALE!! 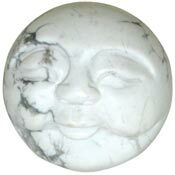 Large Man in the Moon sphere shaped paperweight carving in White Howlite. Cosmic symbols remind us of our link to the infinite. Sun, Moon and Stars carvings are for intuition, growth and inspiration. Howlite is usually white with black or gray veining. It encourages healing by calming physically and emotionally. It dispels negativity and spurs ambition toward positive goals. 2" D - 7 1/2ozs. 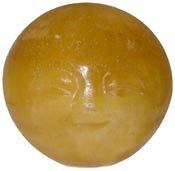 Large Man in the Moon sphere shaped paperweight carving in Orange Calcite. Cosmic symbols remind us of our link to the infinite. Sun, Moon and Stars carvings are for intuition, growth and inspiration. Calcite has long been used as an energy amplifier and orange symbolizes the energy of the mind. Thereby encouraging openness to learning, higher thought and purpose. 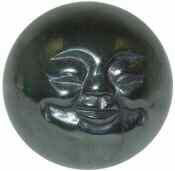 Large Man in the Moon sphere shaped paperweight carving in Black Obsidian. Sun, Moon and Stars carvings are for intuition, growth and inspiration. Black Obsidian from the volcanic bowels of Mother Earth is a very mystical stone, used since ancient times in Shamanic healing rites. 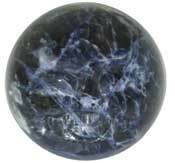 Like all black power stones, Obsidian has been used to banish grief and encourage happiness and good fortune. 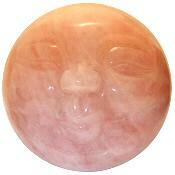 Large Man in the Moon sphere shaped paperweight carving in Rose Quartz. Cosmic symbols remind us of our link to the infinite. Sun, Moon and Stars carvings are for intuition, growth and inspiration. Rose Quartz has a soothing, calming effect and is the traditional lover's stone. Use these for Feng Shui cures, hold during meditation or place on desk to tune in to the crystal energies. 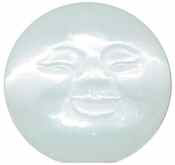 Large Man in the Moon sphere shaped paperweight carving in Selenite. Cosmic symbols remind us of our link to the infinite. Sun, Moon and Stars carvings are for intuition, growth and inspiration. Selenite grows in long "cat's eye" colorless translucent pearl white crystals or stone rosettes and is a form of Alabaster. It is said to be a powerful cleanser of negative energies, even clearing quartz crystals. Large Man in the Moon sphere shaped paperweight carving in Blue Sodalite. Cosmic symbols remind us of our link to the infinite. Sun, Moon and Stars carvings are for intuition, growth and inspiration. Sodalite promotes companionship and self-esteem, it unifies individuals towards a common purpose. 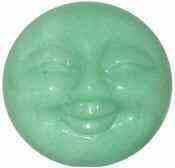 Large Man in the Moon sphere shaped paperweight carving in Aventurine. Cosmic symbols remind us of our link to the infinite. Sun, Moon and Stars carvings are for intuition, growth and inspiration. Aventurine reinforces decisiveness, amplifies leadership qualities and enhances instinctive reaction in difficult situations. Use these for Feng Shui cures, hold during meditation or place on desk to tune in to the crystal energies. 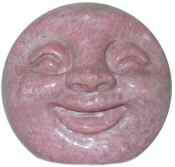 Large Man in the Moon sphere shaped paperweight carving in Rhodonite. Cosmic symbols remind us of our link to the infinite. Sun, Moon and Stars carvings are for intuition, growth and inspiration. Rhodonite is said to balance the yin-yang energies and assist in the attainment of one's greatest potential. Use these for Feng Shui cures, hold during meditation or place on desk to tune in to the crystal energies.